Ever try to get a cheaper version of Windows? Windows 10 is about $140, although you can get a little cheaper if you have a student email (student discounts). That’s still pretty expensive. What about Microsoft Office? It’s about $140 too. Of course there are alternatives to these. Linux as an OS, Libre Office or Apache OpenOffice (although I’d recommend Libre Office, because AOO has un-patched security issues) as an alternative to Microsoft Office. You can acquire Microsoft software in a not “so legal” manner. But if you’re too weary to torrent there is this other method – key resellers. Price Comparison, Official vs key reseller (Kinguin). Kinguin and G2A are the big players in the realm of key reselling. But I’ve seen some on the Amazon Market Place as well. If you visit these sites, you’ll be opening the doors to a digital bazaar , where the prices are cheap. Windows 10? Going for $28.19 right now on Kinguin. Microsoft Office? A sweet $12.91 on Kinguin. It’s one of these amazing feelings, like if you were at a yard sale, with a bunch of things items new in package going for quarters and you’re the first one there. It feels too good too be true. On these markets you can get keys for Steam, Android, Origin, and much more. Games are the big movers here. You can just feel the marketing while you breach the front doors of these markets. But as I mentioned, you can find software like Windows and Office on there as well. This resell market is called a “grey market“, which basically means: trade outside the “authorized” channels of the original manufacturer. Allegedly the name grey market comes from manufacturers, which naturally hate these grey markets, they wanted it to sound like “black market”. But how does this all work, where do these keys come from? Is it legit? All good questions and here’s what I came up with. What are these digital key bazaars? Kinguin bills itself as a marketplace, linking up buyers and sellers and lauds itself as an alternative marketplace to Steam, Origin and Battle.net. G2A seems to toe the same line; it’s terms and conditions make it clear that it’s not a store, but a “platform” to facilitate buyers and sellers, in other words a market place. These places take your money and give it to the sellers (after taking a cut) they accept a litany of different kinds of payments, including conventional credit cards. No need to bust out the Doge Coins (but they do take Bitcoin!). Both these services have boasted over millions of customers, so we can assume millions of sales. Both these big dawgs are based in: Hong Kong, the capital of cheap products (think sites like Deal Extreme). And throughout this process, despite the slick veneer of these web pages, you get a feeling – or well I got a feeling of sketchiness. Which is bigger; Kinguin or G2A ? Hard to say, but looking at Alexa ranks, it looks like that accolade goes to G2A. I couldn’t find Windows 10 on G2A, so G2A seems to be strictly aligned to the gaming side of things. Asides from these, both services on the outside are pretty similar. I should note, while my analysis focuses on these two sites, there is a litany of other players doing this as well, ephemeral fly-by-night web sites, sellers on Amazon market place, pretty much everywhere. I wouldn’t recommend these ones, as they are more likely to be scams. 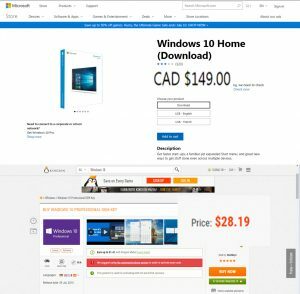 On Amazon.ca, where I looked for Windows 10, I noticed a seller named “Microsoft” selling Windows 10, still expensive at about $125 (but looks more legit that way), but by looking at reviews it’s a scam. I say it’s a scam, because it’s not Microsoft. Check the reviews, especially the one star ones; this Amazon review photo speaks for itself. It’s just a key reseller pretending to be Microsoft. Where do the keys come from? I’m not sure that this is one hundred percent determined. To start off with the ugly, It seems in at least one case, keys were gained from fraudulent credit card purchases. Ubisoft revoked a bunch of keys on it’s platform citing credit card fraud, keys that were largely purchased on Kinguin and G2A. Afterwards, an agreement was banged out that let those with activated keys to keep their grey market goods – but if you had keys not activated? You’re out of luck. Kinguin wrote that their customer service folks were getting swamped with support tickets during this incident and it seems in this case gamers who had their games revoked were able to get their game backs. The credit card argument goes a long way to damning these sites. The argument goes: someone uses a stolen credit card. The keys are sold, but eventfully charge backs are issued and the developers get rinsed a fee on it. So they not only lose their key, but they get fiscally punished. And despite the one big case you have to wonder how many more illicit keys are floating out around there. There’s not much visible auditing going around, so it’s hard to say what’s stolen and what’s not. Certainly not certified organic. G2A has been slammed for it’s incredibly weak auditing process. In case of Polygon’s article on this topic, they discovered one instance a key came from a promotional event. Other avenues of keys seem to come from Humble Bundles, promotional offers (say from a GPU promotion), or taking advantage of regional prices . In some cases, you may have to use a VPN to activate a game, this is potentially a violation of Steam’s terms of service, so you could be seeing the business end of a ban hammer. There’s been some discussion of developers intentionally releasing keys onto these markets – I’m not entirely convinced of that. But it’s not impossible. People like to scam developers too – they masquerade as a Youtube reviewer and ask for keys. When they get them – straight to the grey market. Windows, seems to be a bit more sketchy – activation via the ‘automated phone line’, and a turbulent time of having keys revoked, days or months after the initial activation. Of course a quick Reddit search sees a lot of discussion of these sites, and there always someone who got hurt in this. It seems if your license key doesn’t work right away, most sellers are willing to work it out with you. If look hard enough, you’ll see stories of customer service not doing enough. It seems the support you get is a split bag. Sometimes you get great service; if your key is invalid they will respond within hours and provide you a new (often) working key. But other users report draconian ridiculous procedures, including having the support team REMOTE INTO YOUR COMPUTER and watch you do the validation. I’ll conclude this by saying: You’re mileage will vary. I will state firmly: I’d rather eat the money than let some random support guy remote into my computer. From what I’ve seen, it seems to be a lottery system. It’s quite possible to get keys from these markets and have little issues. Other buyers on the other hand, get slammed with revoked or invalid keys. Unfortunately there are no large scale statistics, so you it’s a risk you’ll have to take if you take this route. Developers occasionally threaten to cancel activation keys bought from these services, so you’ll have to be careful. I think some of the most telling stories are on the respective subreddits for each site, the G2A subreddit (sorted by top of all time), it’s a small sub-reddit but you can see half of the links on the top board are people complaining and begging other users not to use the service. Of course we know people with more negative experiences are more likely to squawk about it. The Kinguin subreddit (much smaller) has a similar story. I’m not a lawyer, but it doesn’t seem that you are at risk in incurring any criminal penalties, or even being sued (as say with piracy). Grey markets are totally legal, so unless you are seller, or somehow caught up in a big fraud case, it looks like you’re safe. So if you’re willing to gamble that price, using one of these market places might be right for you. On critical software, such as an OS, I’d be very cautious about buying a key here. You wouldn’t want to get revoked a month or later after you bought a key. If you have morals and ethics, this is a pretty murky question. On one hand I have no qualms about users sticking it to developers who engage in predatory region pricing. Take for instance, the infamous case in Australia. It turns out if you lived in Australia and wanted the Adobe creative suite, it was cheaper to fly to the USA buy it there, and fly back. That’s just predatory on Adobe’s part. Developers often lower prices in developing markets to try to boast sales, but among the developed nations? It just looks greedy to raise prices in a place like Australia, when your distribution lines are completely digital. I also take lots of glee in seeing consumers gaining an advantage in these markets. Digital goods have been great, but they come with all sorts of controls that physical goods don’t, namely DRM. With digital goods you are just stuck with them, no resale. Developers have gotten a lot of control in this regard, so I relish the sight of seeing them getting annoyed by “grey markets”. So naturally I do at the core like the idea of these sites. But again, it’s not a pure consumer rebellion. There’s bad to go with that new found avenue. But if you take issue with resellers picking up keys using social engineering, stolen credit cards, you’d probably want to keep away from these resellers. You can’t be sure to know what’s stolen, or what was gotten from a Humble Bundle deal. Lastly, I see little issue with gamers selling their unwanted Humble Bundle games, or other games got from promotions. When I used to buy Humble Bundles, my Steam library swelled with a litany of games that I never played. I’m sure a lot of other users experienced the same thing. As way of personal opinion, I’m siding to the no side of the spectrum. There is just too much in the air to make me feel comfortable. I could probably see myself trying it out at one point, probably on a game, and not something critical like the OS. But who knows. G2A AMA (ask me anything) on Reddit, a disastrous one by the way. ← Previous Previous post: Are Lawns Stupid? Next → Next post: Digital Security: How to Secure Yourself.